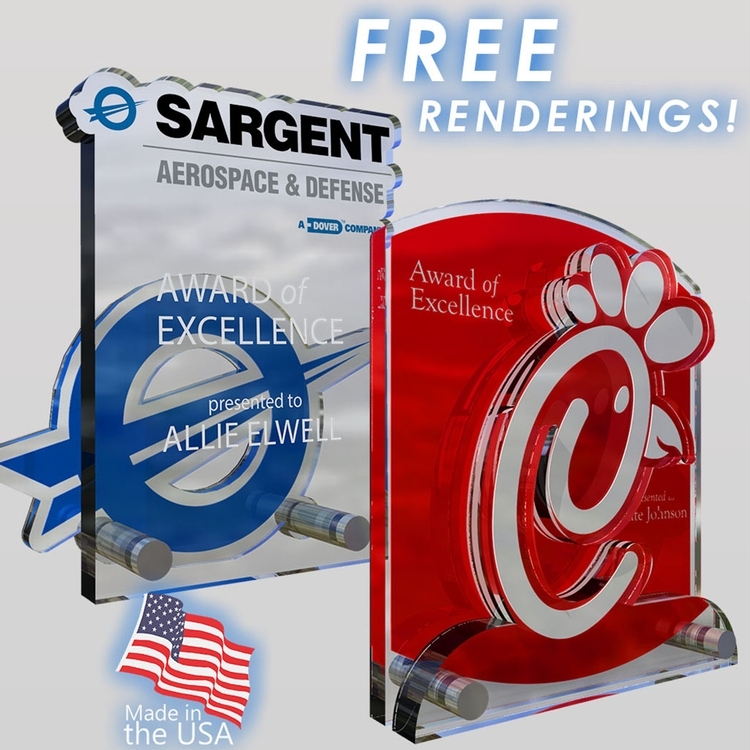 To fly above the norm in an atmosphere of high achievement, the Soar Award, was designed with the goal in sight—Recognition, Praise, Celebration, and Thanks for a Job Well Done! 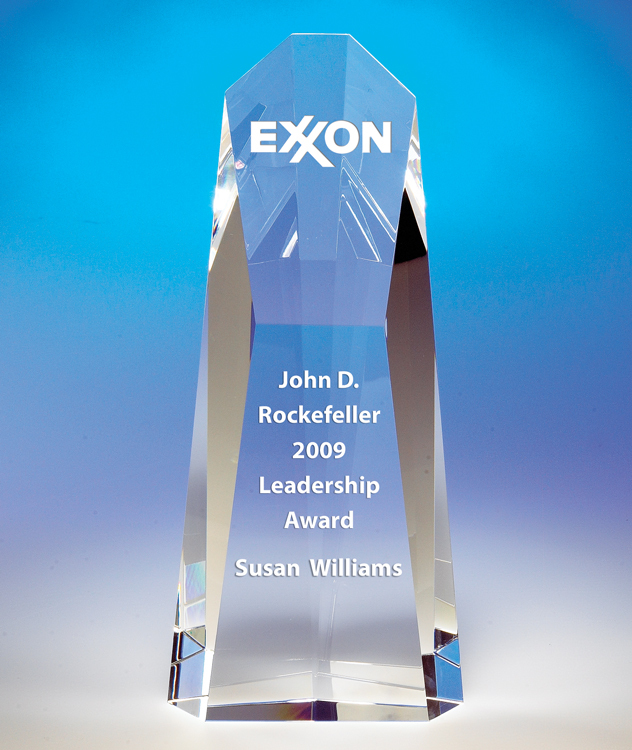 This award brings together complex elements that give a tremendous award presentation. Featuring contrasting curves, sparkling bevels and a rich cobalt blue accent. This piece is a Howard Miller Exclusive Design. Price includes TWO sand etch locations. Comes packaged in an elegant black gift box. Color Splash is a fresh, vibrant, attention-getting technique featuring a unique splatter of intense color hand blown into the crystal. Each hand crafted art piece is a one-of-a kind showstopper! 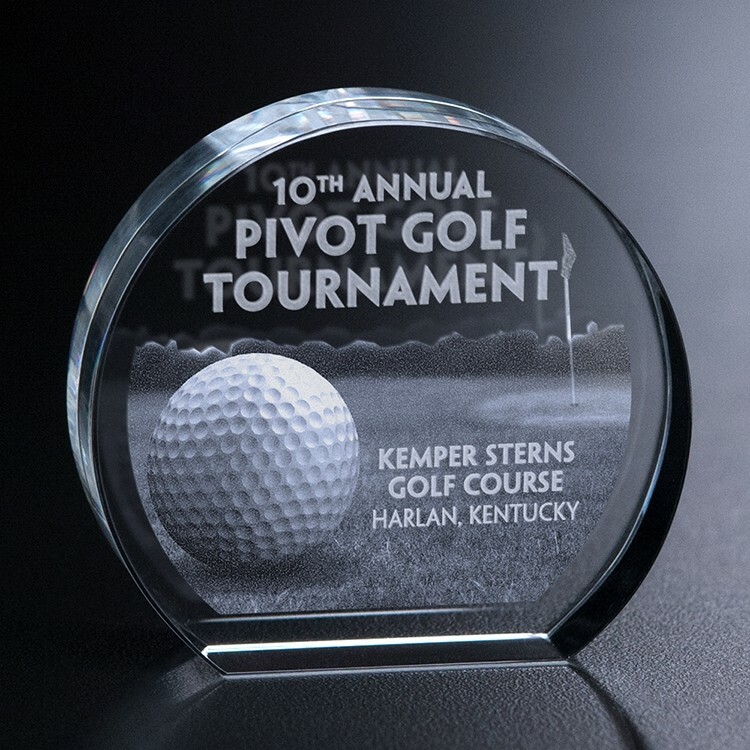 This trophy comes in 3 sizes: Large (12"Hx9 1/4"W) with an etching area of 2 1/2"Hx2 1/2"W and Small (11"Hx8 1/4"W) with an etching area of 2 1/4"Hx2 1/4"W.
9" antique gold fantasy football man in chair. 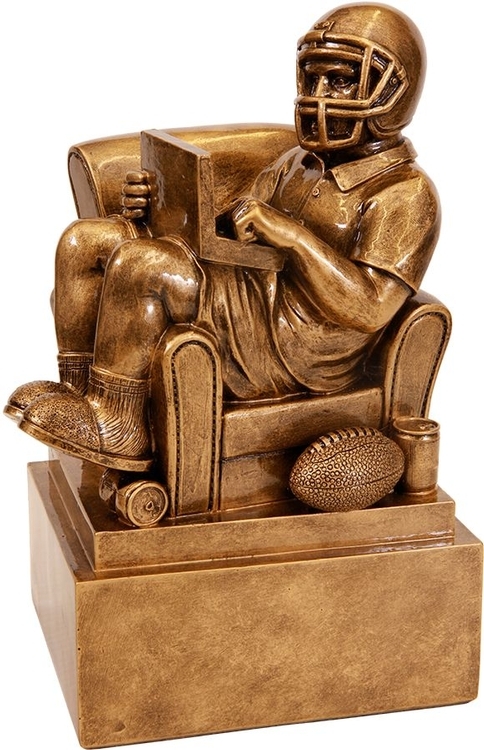 This is the ultimate trophy for any fantasy football league. 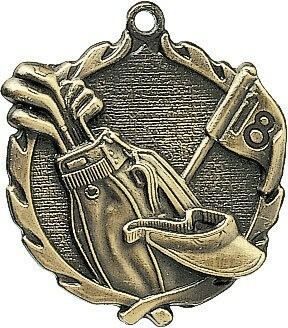 Track your team's stats and progress as you simulate the figure in the trophy's exact pose each week. 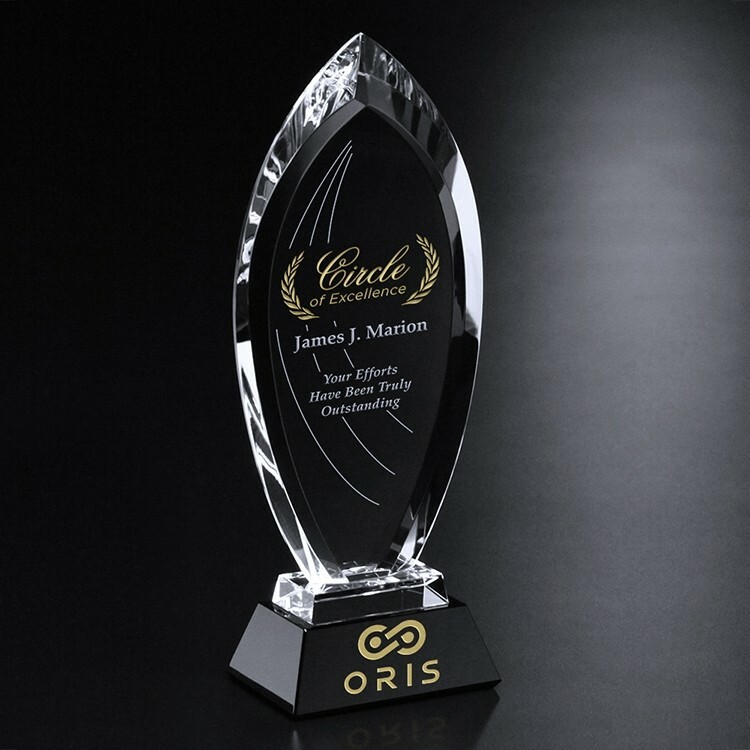 This award also comes fully customizable thanks to our laser engraving services. Add a name, logo, or message to this and commemorate your league's champion in the best way your circle of friends see fit. Choose from either a black plating that engraves to gold, or gold to black. 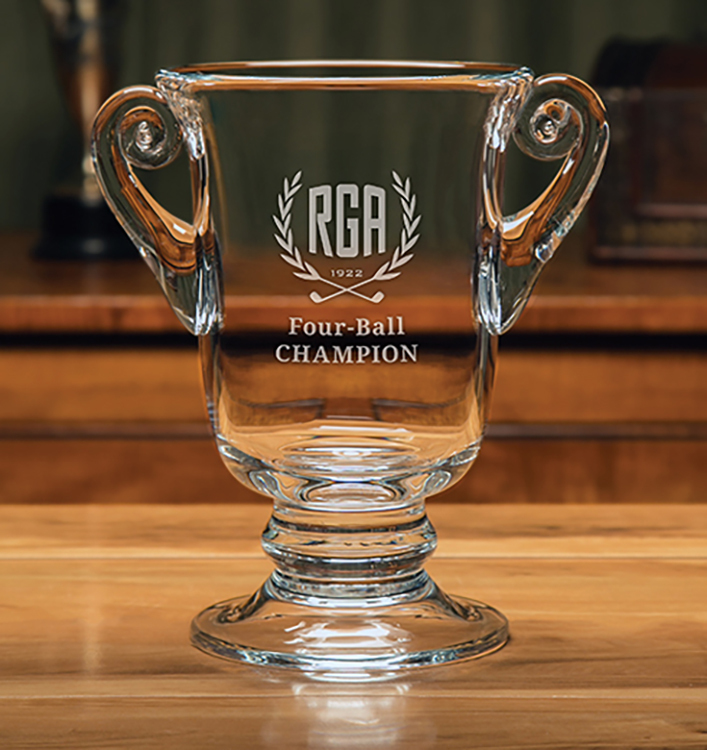 Our handcrafted, non-lead crystal Fairway Champion's Cup features a hand cut and frosted golf ball in the pedestal. Packaged in an attractive gift box. 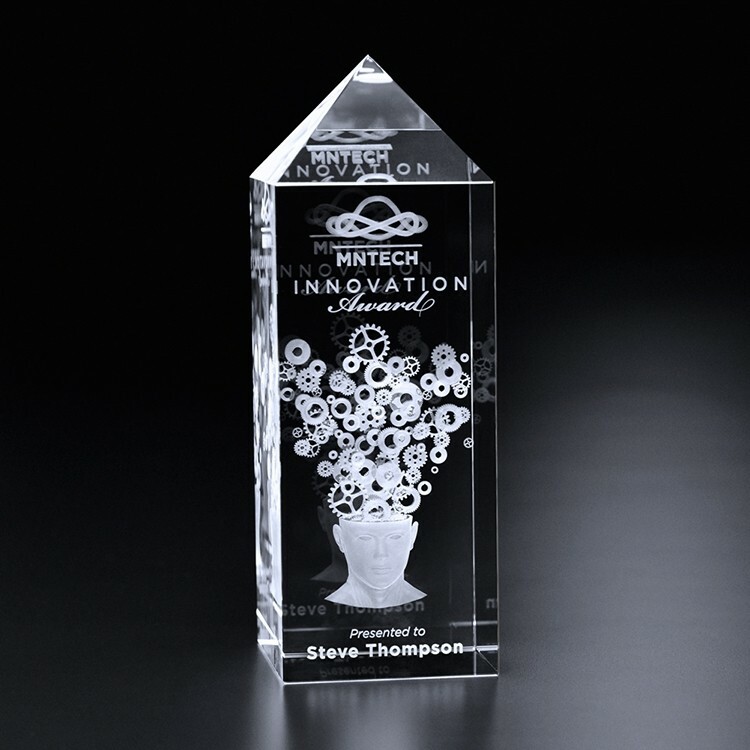 Etch area is 2 1/4"x2 1/2" for medium award (9 1/2"Hx6 3/4"H) and 1 3/4"x2" for small award (8"Hx5 1/4"W). 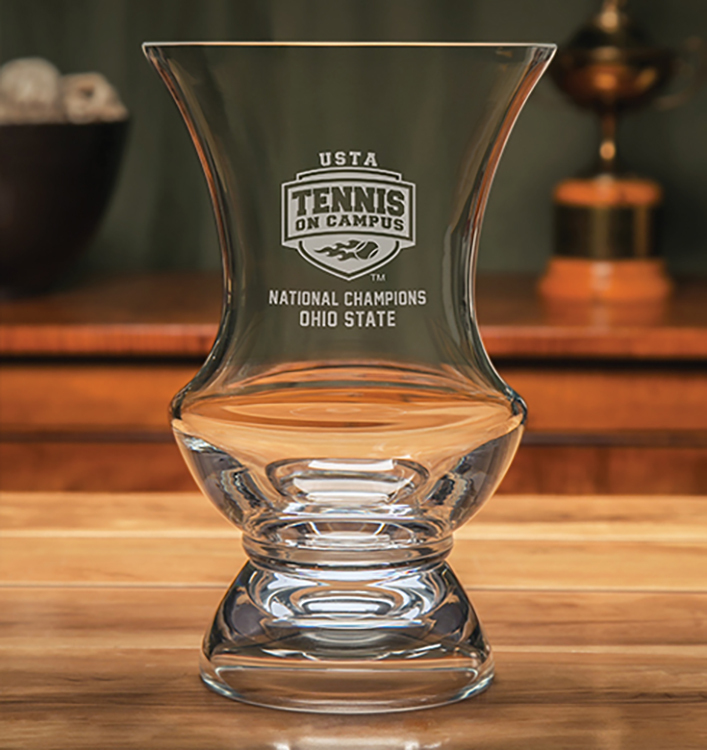 Significant in size and stately in presence, the Olympia Trophy Cup is a top value for any event or competition. 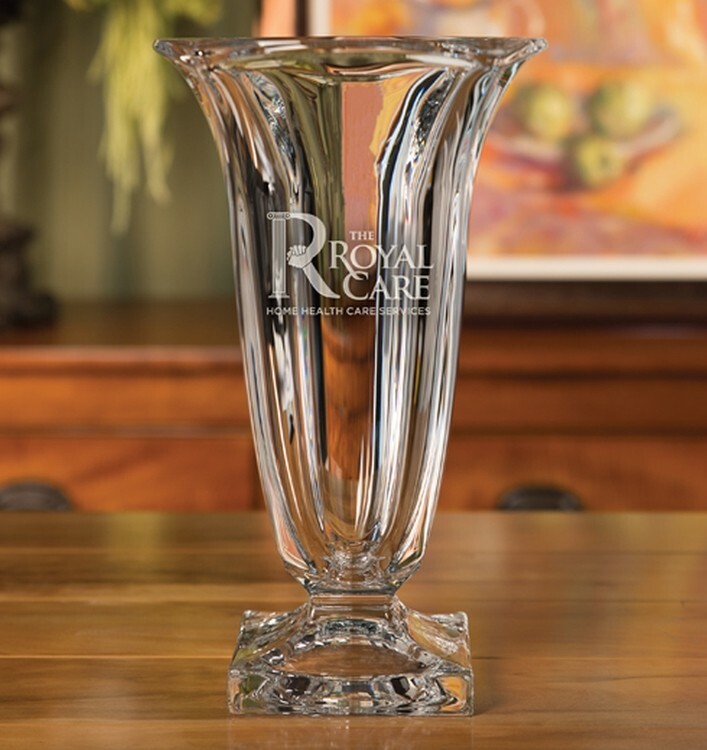 Made of handcrafted non-lead crystal, this regal award features a classic look with elegant scrolled handles. 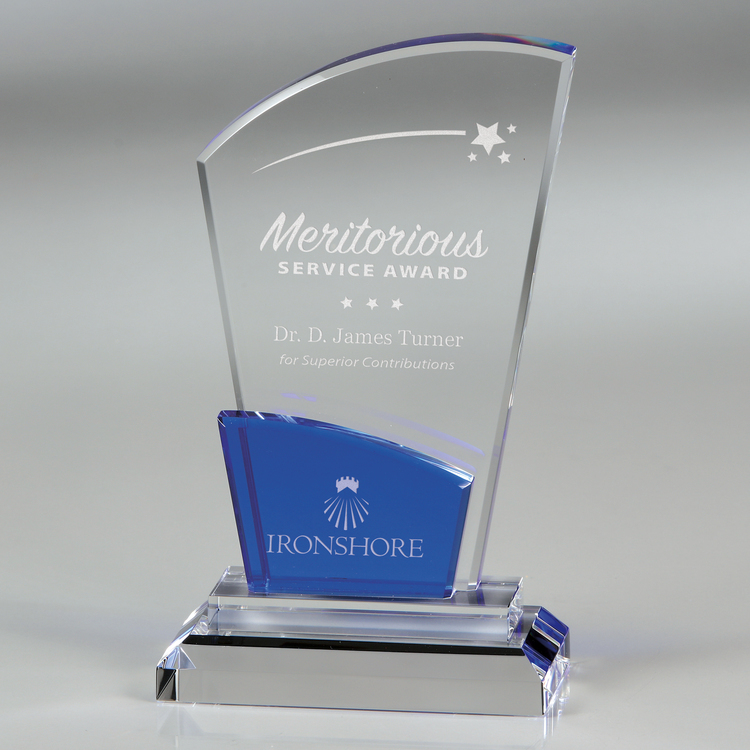 Available in three sizes to acknowledge different levels of achievement. 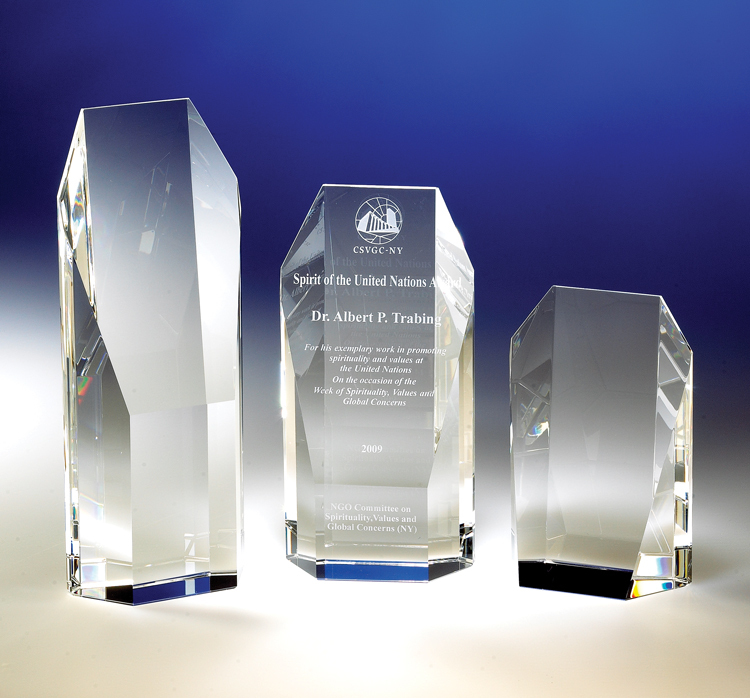 Etch area is 2 1/2"x2 1/4" for medium award (11"Hx7"W) and 2"x2" for small award (9 1/4"Hx6"W). 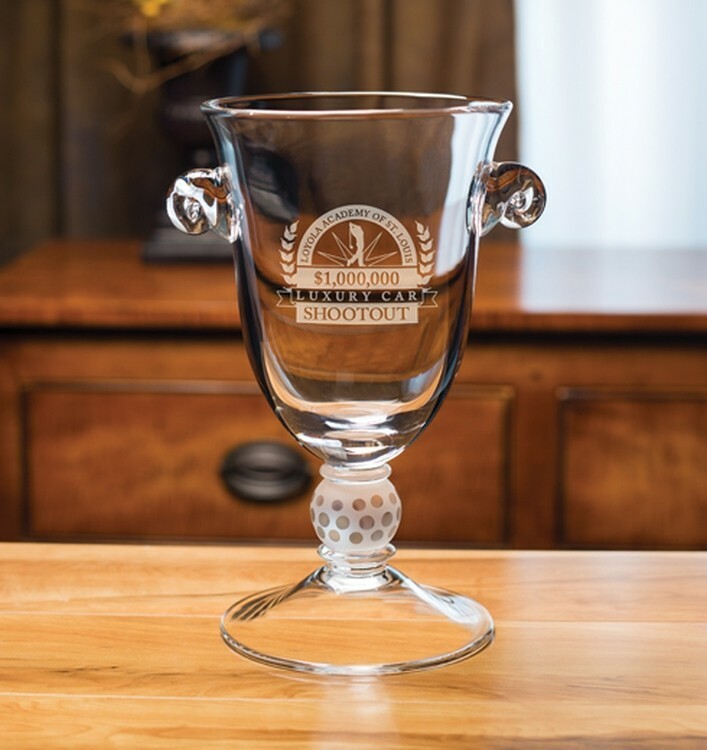 Hand crafted, non-lead crystal with a sparkling heavyweight base and flared top rim. 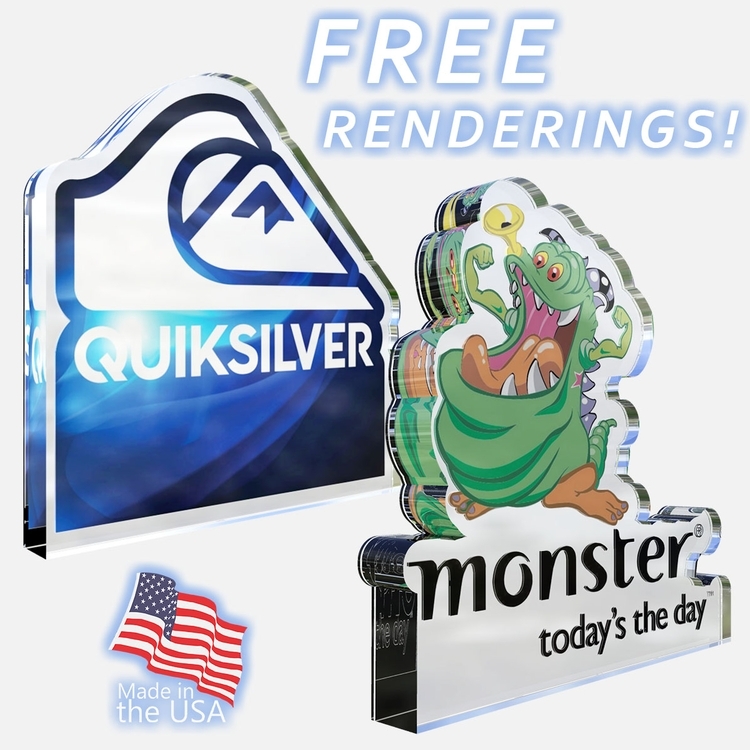 It comes in 3 sizes Large (12"x6 1/2") with an etch area of 3 3/4"x3"; Medium (10 1/2"x6") with an etch area of 3"x2 1/2"; and Small (9"x5") with an etch area of 2 1/2"x2 1/4". 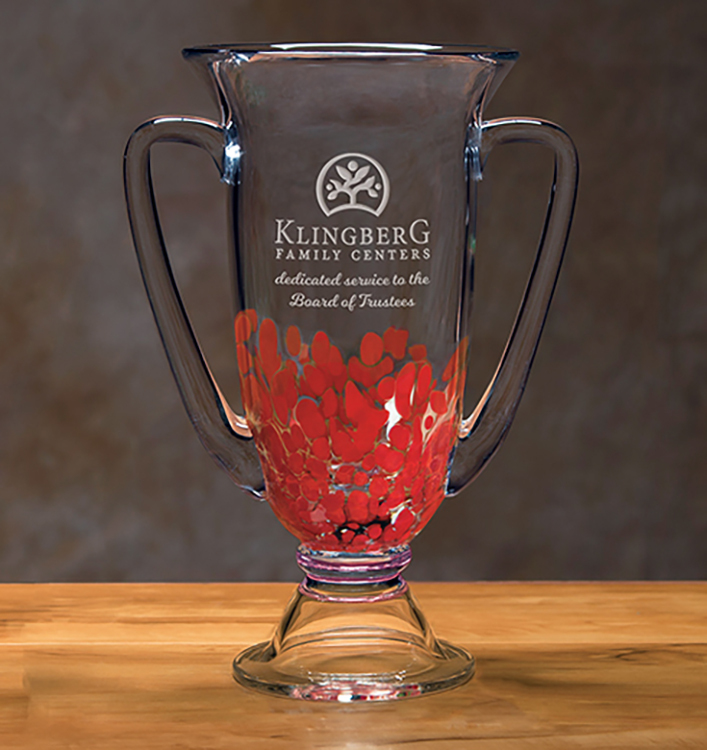 The Chandler Trophy Cup is hand-blown, non-lead crystal that's tall and substantial with a thick base. 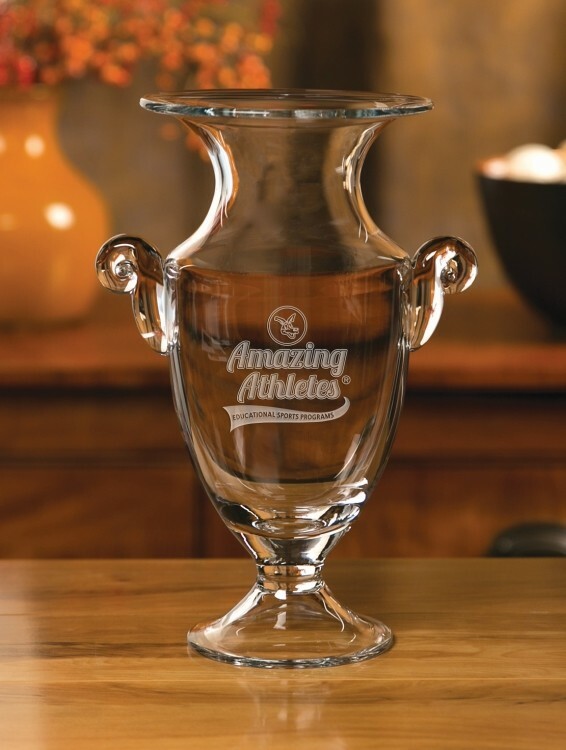 This vase comes in 3 sizes: Large (11"Hx7 3/4"W) with a 3"x3" etching area; Medium (9 3/4"x6") with a 2 3/4"x2 3/4" etching area; and Small (8 1/2"x6") with a 2 1/2"x2 1/2" etching area. 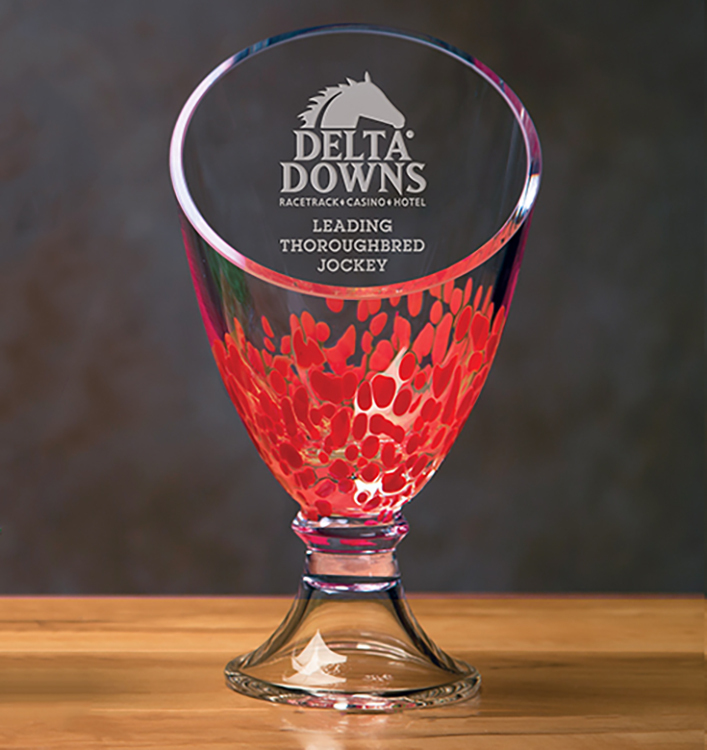 Classic trophy shape, sleek styling in mouth-blown non- lead crystal, highlight our sophisticated recognition trophy. Crafted by hand by skilled European artisans. 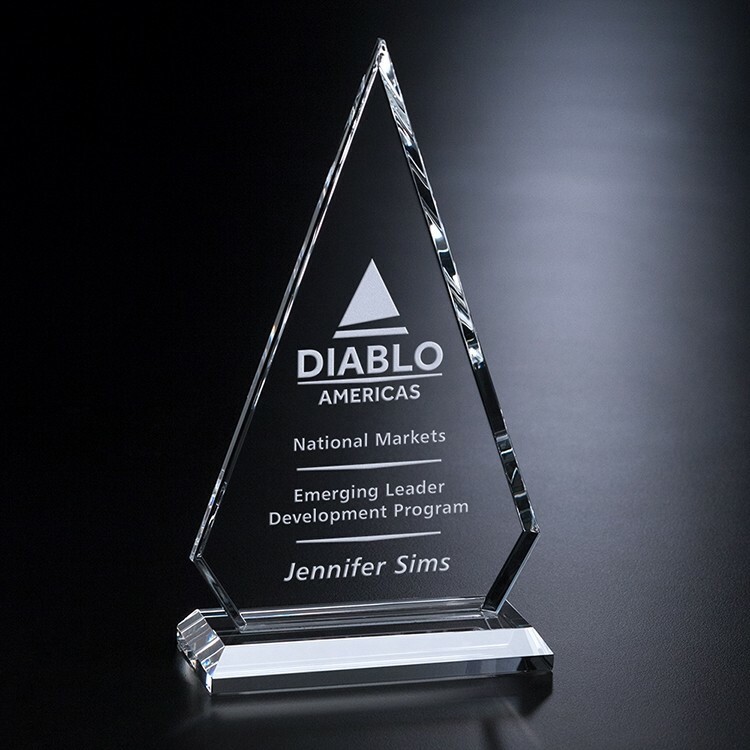 Etched with your logo and recognition message and packaged in an attractive gift box. Etch area is 1 1/2"x1 1/2" for small award (8 1/2"Hx7"W). 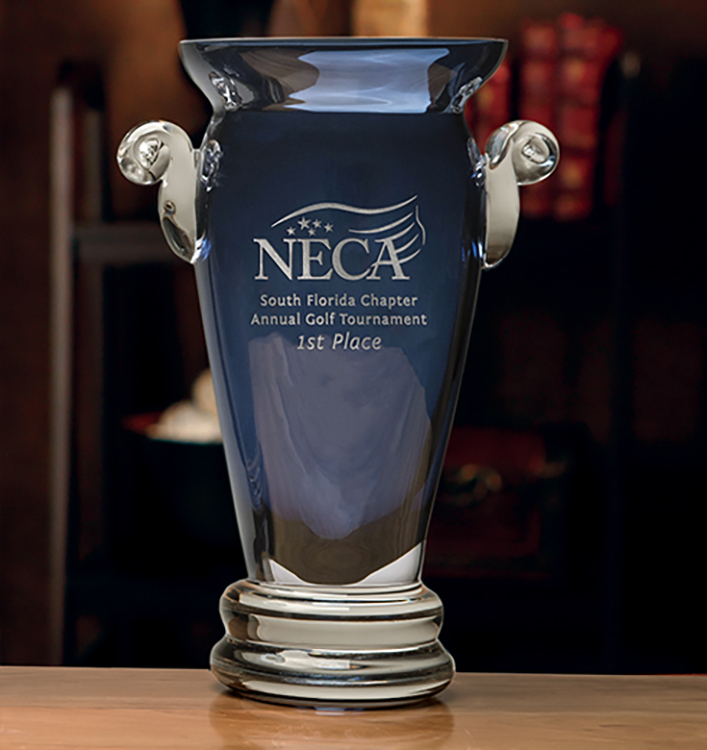 The hand-crafted, non-lead Victor Trophy has a classic pedestal base with unique scrolled hand-crafted handles. 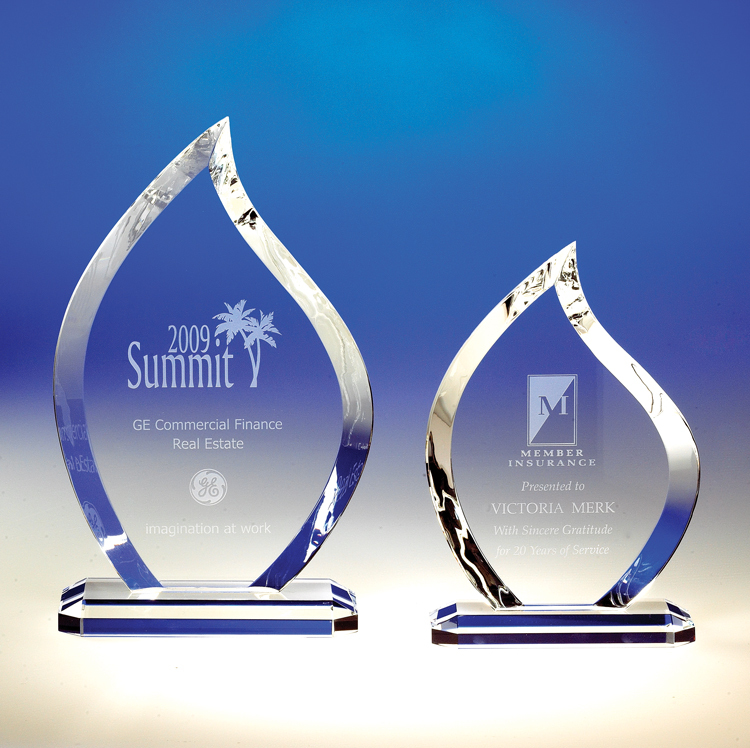 This trophy comes in 3 sizes: Large (10"Hx8 3/4"W) with an etching area of 2 1/2"x2 1/2"; Medium (9"Hx7 3/4"W) has an etching area of 2 1/4"x2 1/4", and Small (8"Hx7 3/4"W) has an etching area of 2"x2". 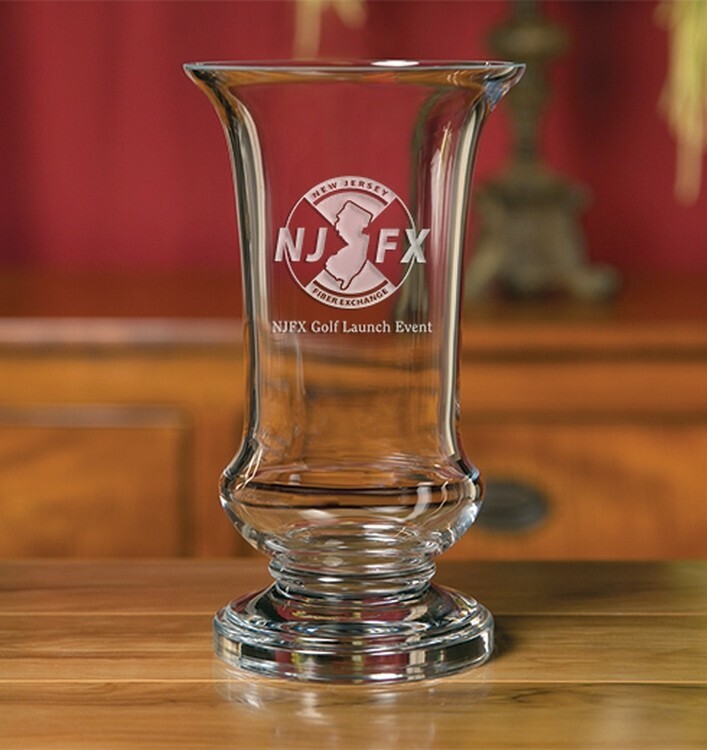 Our Fairway™ Slanted Vase is the perfect gilt or award for a golf lover. 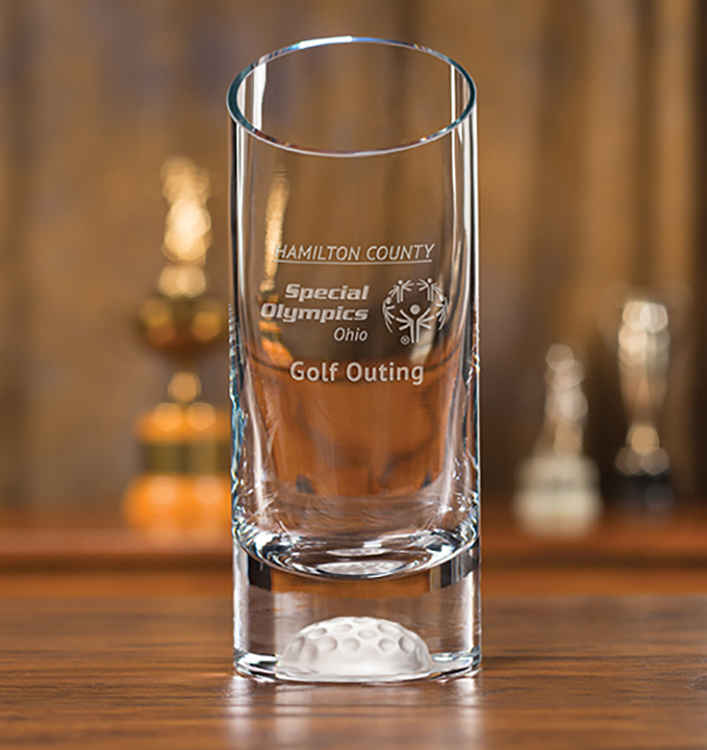 Crafted of hand-blown non-lead crystal, this piece features a distinctive sculpted golf ball bottom. 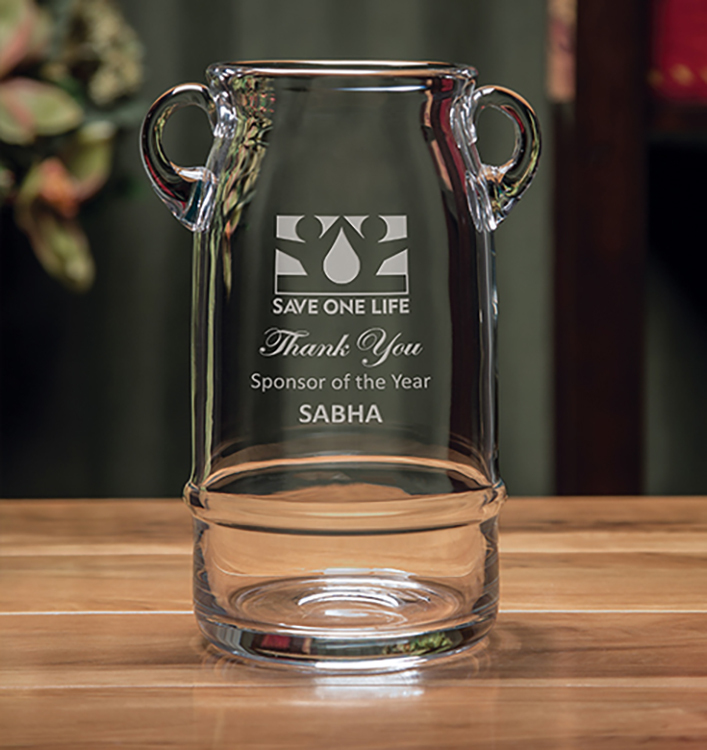 Your personalized vase is available in three sizes and comes packaged in an attractive gift box. Etch area is 2 1/2"x2" for medium vase (9 1/2"Hx3 1/2"W) and 2"x2" for small vase (8 1/2"Hx3 1/2"W). 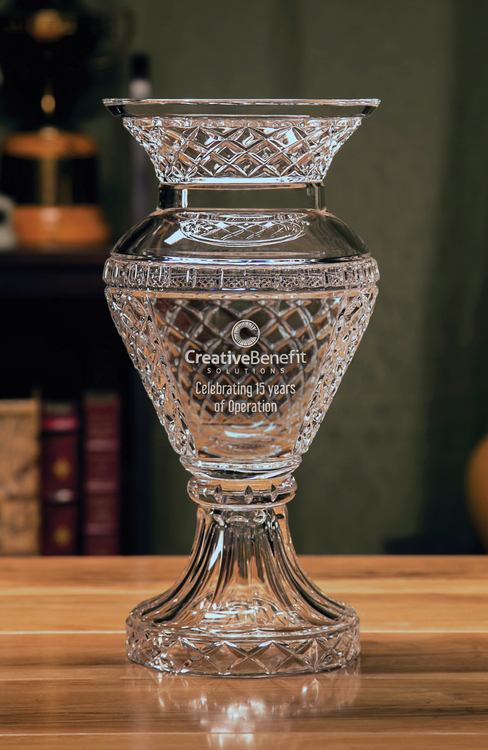 A splendid, heavyweight trophy vase with exceptional clarity and brilliance, the Sidney Trophy Vase has a classic yet contemporary feel. The beautiful piece is handcrafted in 24% full lead crystal and features intricate hand cutting. Available in three sizes. 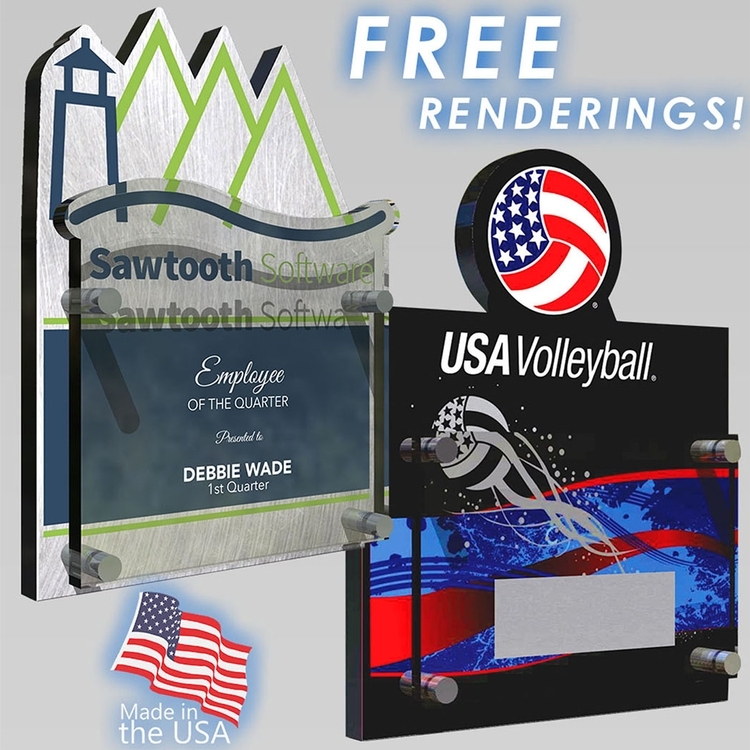 Etch area is 1 3/4"x1 3/4" for medium trophy (11 1/2"Hx5 3/4"W) and 1 1/2"x1 1/2" for small trophy (10"Hx5"W). 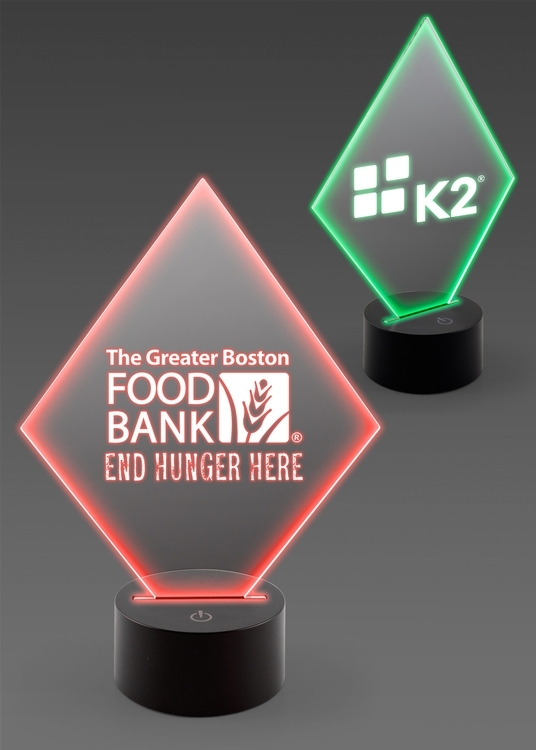 Available in 3 sizes: Large (20 1/2"x9") with a 3 1/4"x3 1/4" etched area; Medium (16 3/4"x7 1/4") with a 2 3/4"x2 1/2" etched area; and Small (14"x6") with a 2 1/4"x2 1/4" etched area. 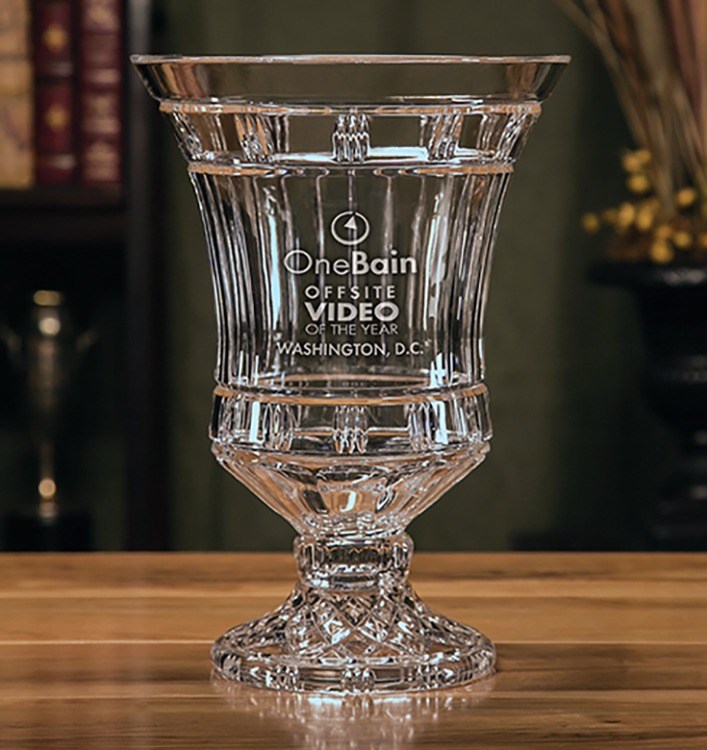 The Ranier Trophy is 24% full lead, hand cut, polished crystal trophy that is tall and grand in size. 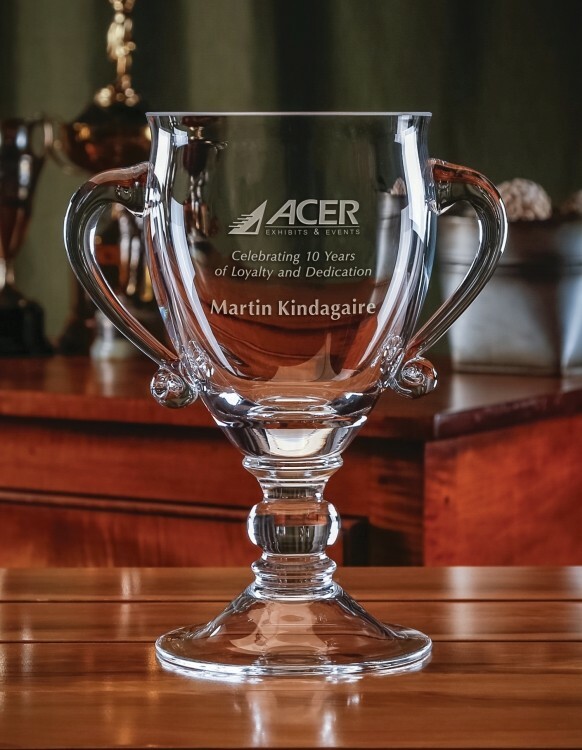 If you are looking for a stunning piece to reward or celebrate success, look no further! 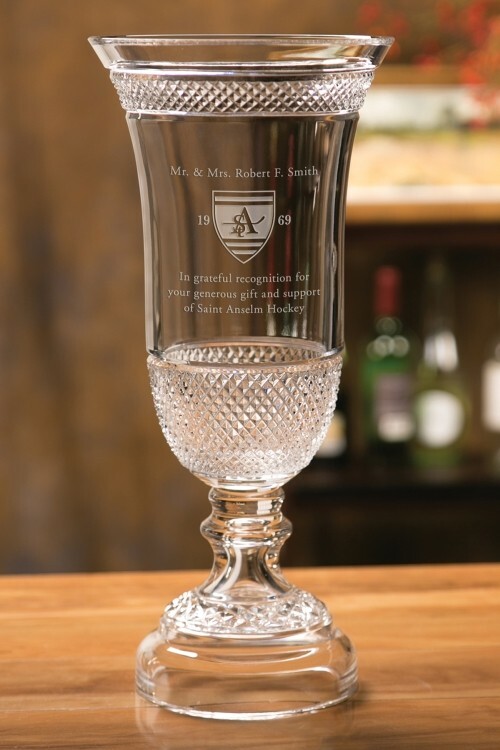 The Regal Trophy Vase is tall and stately, made of fine quality non-lead crystal. Available in two sizes and packaged in an attractive gift box. Etch area is 2 1/4"x2" for small vase (11 1/2"Hx7 3/4"W).